The Garlic Bread Slicer (GBS) is designed for Italian Bread loaves approximately 12” – 16” long to be sliced partially through and to have the garlic spread on the open loaf. 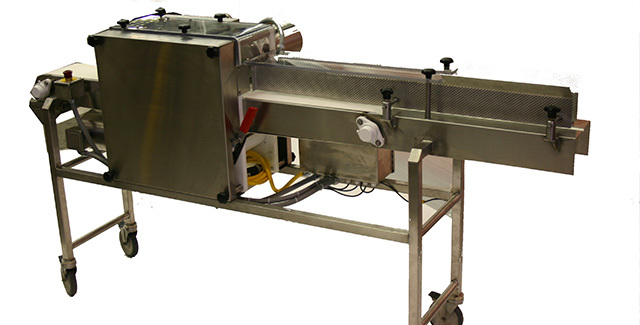 Constructed of all Stainless Steel materials, wash down design, UHMW and plastic rollers, the GBS is designed to handle 30-40 loaves/minute @ 16”long x 4” wide maximum. Controls: Wash Down Control Panel side mounted with motor protection and overloads. On/Off Push Button Controls and Emergency Stop.